In an increasingly health-obsessed country, a "taco salad" might not initially make Cooking Light's Top 10 List. And why not? Remember the "taco salad" of the 90's, complete with a fried flour tortilla bowl (400 calories), and ranch dressing (343 calories), taking you up to 743 calories pre-meat, greens, and other ingredients? It can't really come as a surprise, as this is old news that surfaced when every Chi-Chi's, Chevy's and El Chico prominently featured the taco salad on lunch and dinner menus. Drop the fried bowl and the creamy dressing, though, and you have something fresher, better, lighter. Today, we discovered that Taco Mojo is featured in Colorado Weddings Magazine blog. Who knew? Rachel and Dave were married last year at Lone Hawk Farm, a very rustic working farm in a secluded part of Boulder County, near Longmont. Lone Hawk Farm is available for weddings and other special events during the summer, and grows a wide variety of organic vegetables available for purchase. This evening, our good friends in the Worship Experience Team and the Music Department Cherry Hills Christian Church are enjoying their Taco Mojo Bar Deluxe with barbacoa and grilled citrus chicken tacos before going to see Chris Tomlin play at Red Rocks tonight. They are excited to see Chris Tomlin, a Christian singer who has been awarded three GRAMMY nominations, 18 Dove Awards, one platinum and three gold albums. He has ten #1 radio singles playing on the radio which include some of his best, such as as “Forever,” “Indescribable,” and “How Great is Our God." What a perfect night to enjoy some great food, fellowship, music, and a beautiful spring weather (finally!) at Red Rocks! On Saturday night, some of Taco Mojo's most prized clients gathered in our Cantina Room for vino, cervezas, and botanas (snacks). Our clients have already enjoyed Taco Mojo parties, however this was our way of saying thank-you for their business. And of course, we had ulterior motives. As Taco Mojo and it's Mexican-inspired cuisine gains in popularity, the variety of menus is beginning to expand. Tacos will remain the common denominator, while new entrees, side dishes, and signature salads will provide a new, upscale option for clients who are looking for a catered experience that, while still casual, represents a little more of a "fork and knife" experience. 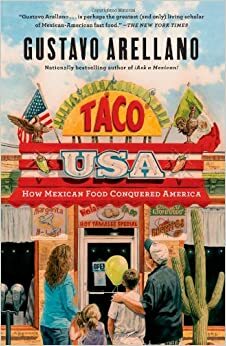 Several months ago, I caught wind that there was a soon-to-be-released book by Gustavo Arellano called Taco USA that might be an interesting read. It was released on or around April 10th, but for whatever reason, I haven't made it yet to Tattered Cover. And now, it's on the top of my To Do list. Not only was Arellano in Denver this week, but there's considerable mention of Denver's own contributions to the Mexican food culture here in the United States. Westword covered his stay here in Denver in an interview by Patricia Calhoun. When we launched Taco Mojo 2 1/2 years ago, we thought that Mexican taco bars might be a big hit for rehearsal dinners. Little did we know that brides and grooms would not only embrace taco buffets, but would prefer them for their wedding reception over more traditional wedding fare. In fact, last night Taco Mojo provided a full-service wedding reception at Hudson Gardens for 120 guests. And again tonight, we will cater another wedding reception with buffet service for 122 guests at The Sanctuary Events Center. In fact, we have more Taco Mojo weddings scheduled this summer than ever before. But is this just a short-lived fad? I've been wondering "what do brides really think about Mexican food for their wedding?" Too messy? Too casual? Too unusual?